Our white lightning matched with our large 40 inch blade set and buck boost MPPT controllers provide power performance that leaves the mainstream e commerce small wind market scratching their heads. 20 lb plus generator and stator which weighs 3-4 times that of similar priced models. If you are tired of playing around and want to make some real power this is the one for you! Yes it is true that in a wind gust for a few seconds you may see a wattage spike of up to and in excess of 2500 watts for a few seconds but this ignores the realities of how a wind turbine is rated in the small wind industry. You should consider before buying a permanent magnet alternator or wind turbine from anyone: Wind Generators do not produce any power until the RPM of the spinning generator creates voltage exceeding that of the battery bank or grid tie inverter for which it is powering. Until this point the generator spins freely. This RPM level is often referred to as the "cut- in" point. Torque not RPM dictates how much power is produced. Using longer blades, larger swept area, and more blades typically make more torque. Hooking a Permanent magnet alternator to a 5 horsepower or more Gasoline engine has nothing to do with a realistic display of what you would see in the real world. Obviously the torque input from this device would readily exceed what you may expect from a wind turbine. Our run video uses a 10 amp 110 volt drill as a power plant. This produces approximately 1100 watts of input power. This should offer the buyer a realistic perception of the power with which they can expect to see from the product. 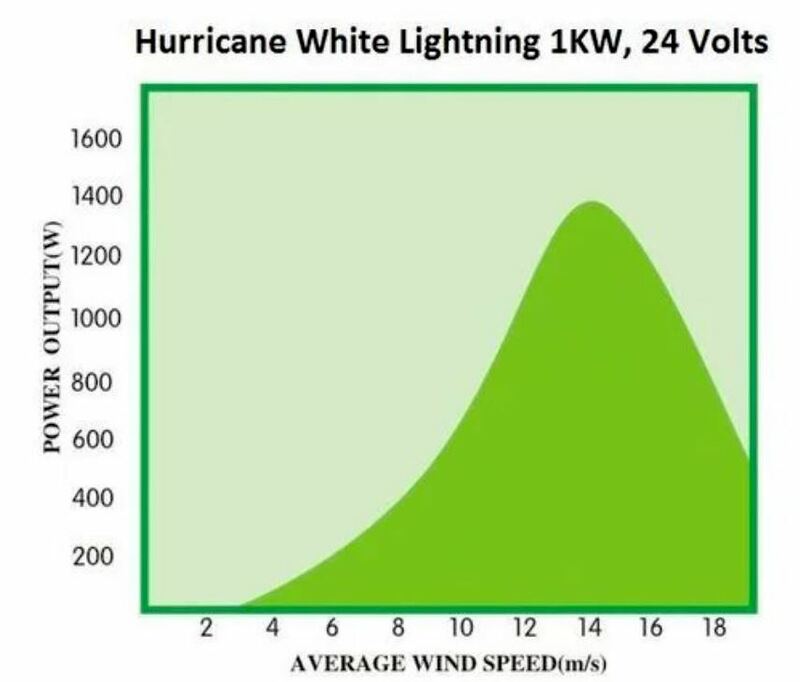 This is the PMA we are using in the new "White Lightning" wind turbines From Hurricane offered for sale individually. Our run video is based on a horsepower input of just under 1.5 HP and, according to the Law of Conservation of energy, energy can neither be created nor destroyed but merely change form. In this exchange of electrical input to mechanical input back to electrical output measurement you can see the efficiency of this generator. Click the button below to add the Wind Generator White Lightning 24V 1000W Permanent Magnet Generator Hurricane to your wish list.